I’ve just updated our Payments page, and thought I’d go thought the pro’s and con’s of the currently available online payment options for small businesses and sole-traders (Spoiler – It’s not at all straightforward). 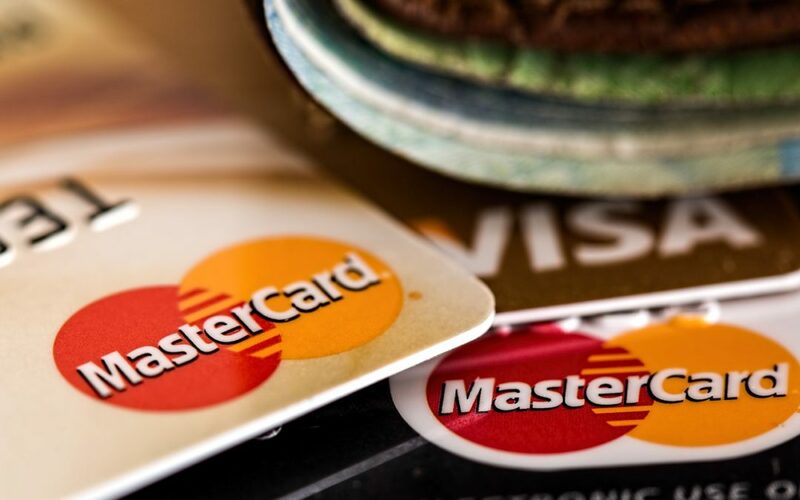 Note: This article refers to a small businesses options for occasional payments, not the more expensive payment options that require more sophisticated arrangements. Who doesn’t have a Paypal account these days? Paypal is by far the easiest method of accepting payments online. Anyone can go to the Paypal buttons page and create a button or cart for their website. Paypal also have an invoicing system allowing your clients to pay using their Credit/Debit card or Paypal balance. Paypal doesn’t give customers the option to pay directly from a bank account (except by logging in and routing it via a bank account associated with their Paypal account), but in the past I’ve used the editable Terms and Conditions section to add BACS info. Paypal’s popularity is also drawback. Customers may perceive it as less professional. Its popularity also draws wide criticism from people whose accounts have been locked or limited for various reasons, with Paypal often not seen to resolve situations quickly enough. So it’s a good idea not to tie your future entirely to Paypal. Paypal also have a service called Paypal.me which allows you to create a payment link on the fly. 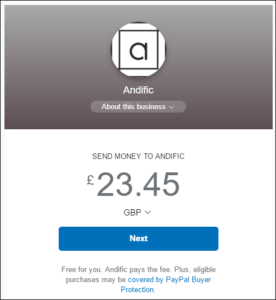 For example, We have registered the Paypal.me username “andific”. If we wanted someone to pay us £23.45, we could just send the link paypal.me/Andific/23.45, which presents a page requesting 23.45. Any number can be suffixed to paypal.me/andific/ to ask for a payment of that amount. The big downside of Paypal.me is that unlike Papal’s buttons or invoicing, the customer is taking to a page where they must login or register with Paypal. Checkout with a Credit Card as a guest is not an option as it is with a normal Paypal link. GoCardless use the Direct Debit system to take single or recurring payments from customers’ bank accounts. Here is a comparison between Direct Debit and BACS. This puts you in control of the transaction rather than the customer. As well as recurring payments, GoCardless allow you to create “paylinks” much like Paypal.me. Unfortunately you can’t create these on the fly. You have to login and create each one individually for each client. The big downside of GoCardless is that the customer can be apprehensive about Direct Debits – associating them with recurring payments. We had a client recently who emailed wanting reassurance about paying by this method despite the payment screen clearly stating it was a one-off payment covered by the Direct Debit Guarantee. We use Wave as our accounting software. They also allow invoicing of clients. They use the very popular Stripe to process payments. Unfortunately they only process Credit/Debit cards, which is very limiting. The big benefit of having it tied to an accounting system is that when the client pays, it’s in your system. So can you accept Paypal, Cards and Bank at the same time? 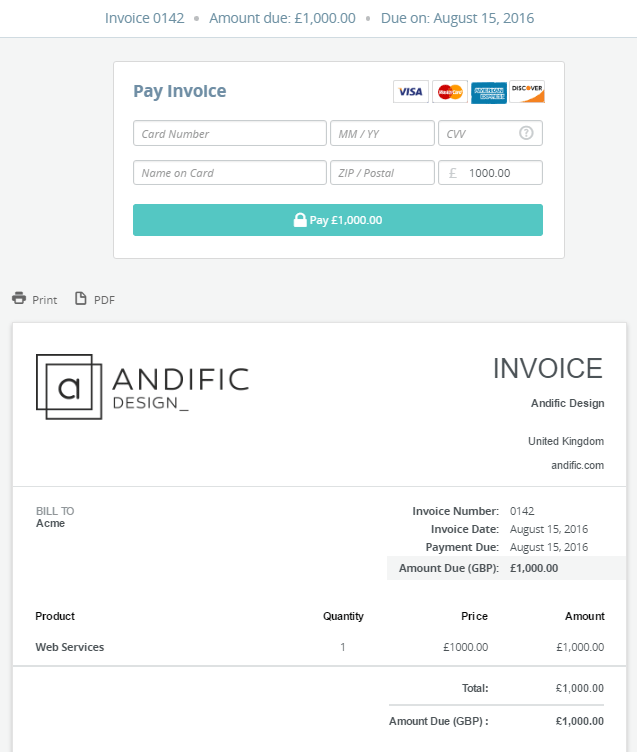 Paypal invoice/buttons lets you take Paypal account payments or Credit/Debit cards. GoCardless is Direct Debit only. Wave/Stripe is Credit/Debit Card only. Paypal.me and GoCardless give you the ability to create links that could be added to another payment option as additional options for special customers you want to give maximum choice to. Just by adding it to the covering email, or adding them to the Notes section of any invoice. Despite all of the above providers having explanaton links about their systems on the payment page, we have had customers email us to check if the payment method was secure. Everyone’s heard of Paypal. But despite Stripe being the processor for a lot of internet payments these days, they aren’t a household name. GoCardless are a relatively new company, but because they are using Direct Debits, they are backed by the Direct Debit Guarantee. To reassure customers, it is worthwhile creating a page like our Payments Page, so there is an easy direct-link to the safety and security info required to reassure customers. Make sure to have this link close to anywhere you ask for payments.